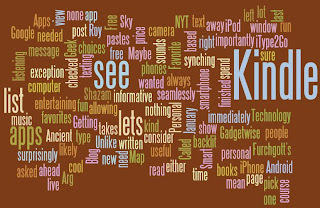 Roy Furchgott’s NYT Blog, Gadgetwise: Getting Smart about Personal Technology, is always informative and entertaining. His post for January 4, 2010, is no exception. Called My Favorite 14 Apps of 2009, it’s based on his choices of the apps “that I was most likely to show people when they asked ‘What do I need with a smartphone?’” You can see his list here. Being an Ancient Geek, I immediately checked the list to see what I had on my iPhone and, more importantly, what I needed. Arg! I had none of them, and I’m not sure I wanted any, either. Google Sky Map sounds kind of cool, but it’s for Android phones. Shazam? Maybe, but I don’t spend a lot of time listening to music away from my iPod or my computer. So which apps *do* I consider my personal favorites? A #1 is my Kindle app – of course, if you don’t have a Kindle, it will mean nothing to you, but it lets me pick up where I left off on my Kindle books by synching to the last page read. Unlike the Kindle, it’s backlit, and the price is right – free. A new one that’s fun and surprisingly useful is iType2Go, which lets you see what you’re about to run into while you’re texting by allowing you to type over a live camera view of what’s ahead of you. When you are finished with your message, it takes you to your text window and seamlessly pastes in what you’ve written. Free. A recent favorite is Cleartune, a chromatic instrument tuner and pitch pipe that allows you to quickly and accurately tune up using the built-in mic in your iPhone. I have a treasured Martin guitar (and I play in a band) so having a tuner on my iPhone is incredibly useful for me and for my friends. By App standards, it’s not cheap ($3.99) but it’s worth it. Dragon is another new one that a genius employee at the Apple store showed me – it’s a great dictation tool. Say what you want to say and it transcribes your words to an email message or to IMS. Honest – and free. There’s also a personal useful app provided by my credit union which shows the location of free ATMs in the area – that one gets a lot of use! Apps I thought I’d use but don’t – My Lighter (cutesy, but that’s all), the free level tool, A-Level (somehow never need to tell if something is level by using my phone) and a recipe app called Big Oven – just don’t have time for that one. What apps are your favorites? Send a comment and let me know. Oh, yeah – and here’s the link to the apps store - always fun to browse. The Staff Picks tell a lot about the staff. What do *your* apps tell about you?